I received false results trying to count an image. Please advice. 1. Run AnyCount and add your image file. 2. Click on the "Settings" button. 3. Switch to the ".BMP, .JPG, .PNG, .GIF" tab. 4. 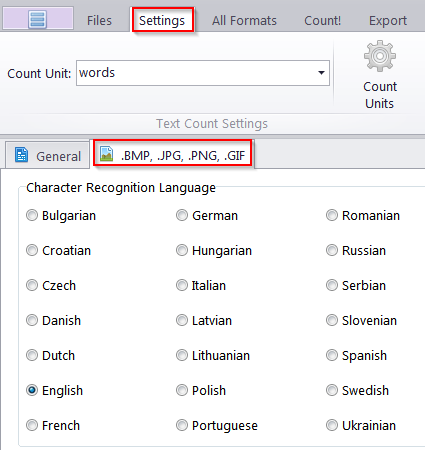 Select the required language. 1. Avoid all signatures, pictures which do not contain text and stamps. Erase all such objects in your image files to get absolutely right results. 2. If you have image files which contain rotated text, please, rotate these images to establish a normal view of the text. Files with rotated text will be counted incorrectly. 3. The resolution and quality of the image files have a high influence on the quality of the count. Thus make sure that you have a normal resolution and quality of your image files.